Moto3 got the qualifying action under way for the Catalunya Grand Prix with Maverick Vinales experiencing plenty of bike drama as Mugello race winner Salom displayed excellent timing to storm to pole. Spaniard Salom timed his run on his Red Bull KTM Ajo to perfection to beat his counrtyman Alex Rins to pole, the Estrella Galicia rider having to settle for second. The front row was completed by Mahindra rider Miguel Oliveira, the only rider not from Spain to feature in the top seven. 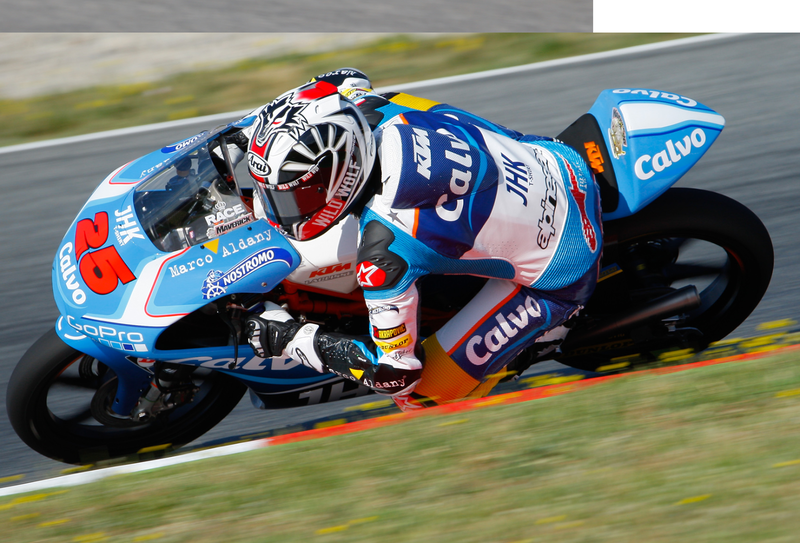 Fourth went to a flying Alex Marquez,with Rins team-mate putting in a great final lap to move up the order, while Vinales starts fifth for Team Calvo after a session filled with drama. After a heavy highside after just eight minutes Vinales set back out with his repaired bike only to be forced to pull off track with a damaged engine, leaving him to have to wait out the remainder of the session to see where he would finish. A returning Efren Vazquez was immediately back on form for Mahindra and completes the second row in sixth. The remainder of the top ten was filled with the best performing FTR Honda machines with Isaac Vinales in seventh after his excellent performance on Friday, Jack Miller took eighth, Niccolo Antonelli ninth and Alexis Masbou completed the top ten. British riders John McPhee and Danny Webb struggled a little after their strong performances so far this year and start 20th and 21st respectively. In Moto2 Pol Espargaro scored his second pole of the season with a time set early on and not beaten as the sessions seconds ticked away, he is joined on an all Kalex front row by Marc VDS rival Scott Redding in second and his team-mate Tito Rabat in third. Italtrans rider Takaaki Nakagami starts off the front row for the first time in fourth, while both he and fastest Speed Up rider Alex De Angelis in fifth set their fastest times on their sixth laps, with the Forward racing rider crashing out of the session early on. 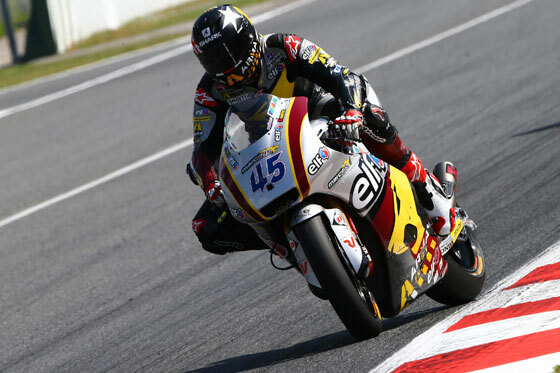 Suter riders Johann Zarco, Jordi Torres and Randy Krummenacher were sixth, seventh and eighth respectively with an ever improving Sandro Cortese in ninth and Swiss rider Tom Luthi completing the top ten. Brits Danny Kent and Kyle Smith had an improved time on their respective bikes. Their knowledge of riding in Spain pushed them up to 17th on the grid for Tech3’s Kent and 18th for Blusens rider Smith.